Coolhorse has room for a very limited number of consignment saddles. We try to be very strict about the condition of the saddles we are willing to represent. The same criteria applies to consignment saddles as to our trade in saddles. We prefer popular name brands made by "upper end" saddle makers. We ask they be in very good condition needing no major repairs and absolutely no broken trees. If your saddle is perfectly clean and ready to photograph there is no up-front charge. For saddles that require cleaning there will be based on how dirty the saddle is. 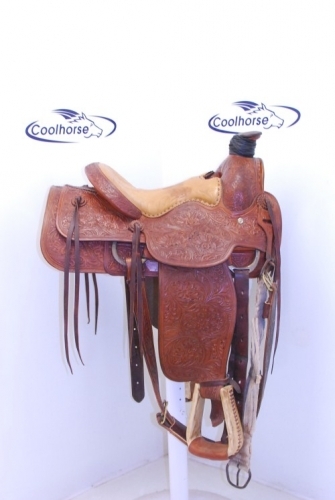 If your saddle sells through Coolhorse we will keep 25% with a minimum fee of $250 for all saddles sold up to $2,000. Saddles between $2,000 and $3,000 we will charge 22%, and saddles over $3,000 we charge 20%. If you would like to get on our consignment waiting list, please email us with a short description of your saddle, photos, and let us know how much you need to get for your saddle. If we feel like your saddle is one we would like to represent and that it has a good shot of selling and getting you the amount you need for it, then we will work out the details and you can ship us your saddle and go through the necessary paperwork.